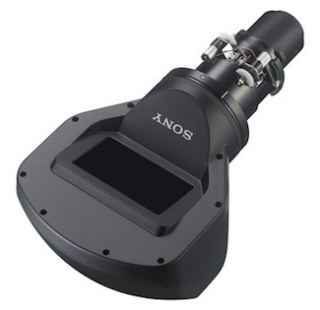 The What: Sony will show the VPLL-3003 Ultra-Short Throw lens for the VPL-FH60, VPL-FH65, VPL-FHZ57, VPL-FHZ60, and VPL-FHZ65 projectors at InfoComm 2016. The What Else: The VPL-30003 is a high performance ultra short throw lens. With a throw ratio of 0.33:1 it enables a large image with minimum throw distance. Due to an advanced optical design, optimal focus and minimal image distortion can be achieved. The VPLL-3003 also has approximately plus/minus 5 percent vertical and horizontal lens shift. The lens can project an 80-to-300-inch diagonal image with minimal throw distance (39 inches throw distance for 140-inch diagonal image), making it ideal for small meeting rooms, as digital signage or use in museums. The Bottom Line: The VPLL-3003 ultra-short throw lens is Sony’s newest lens option and the first interchangeable ultra-short throw lens for 3LCD projectors. This lens offers sharp focus and minimized picture distortion due to a large mirror system, and easy adjustment of lens shift and focus via remote control. Its 0.33:1 throw ratio allows it to be used in tight spaces with no clearance from the wall.